This paper is concerned with parallelizing the TVD–Hopmoc method for numerical time integration of evolutionary differential equations. Using Intel® Parallel Studio XE tools, we studied three OpenMP implementations of the TVD–Hopmoc method (naive, CoP and EWS-Sync), with executions performed on Intel® Xeon® Many Integrated Core Architecture and Scalable processor. Our implementation, named EWS-Sync, defines an array that represents threads and the scheme consists of synchronizing only adjacent threads. Moreover, this approach reduces the OpenMP scheduling time by employing an explicit work-sharing strategy. Instead of permitting the OpenMP API to perform thread scheduling implicitly, this implementation of the 1-D TVD-Hopmoc method partitions among threads the array that represents the computational mesh of the numerical method. Thereby, this scheme diminishes the OpenMP spin time by avoiding barriers using an explicit synchronization mechanism where a thread only waits for its two adjacent threads. 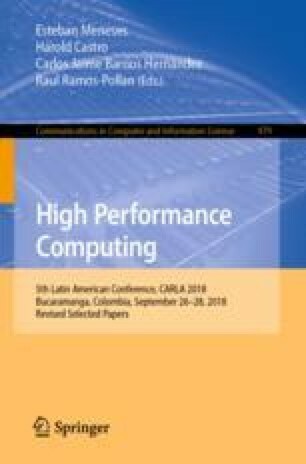 Numerical simulations show that this approach achieves promising performance gains in shared memory for multi-core and many-core environments. CNPq, CAPES, and FAPERJ supported this work. We would like to thank the Núcleo de Computação Científica at Universidade Estadual Paulista (NCC/UNESP) for letting us execute our simulations on its heterogeneous multi-core cluster. These resources were partially funded by Intel® through the projects entitled Intel Parallel Computing Center, Modern Code Partner, and Intel/Unesp Center of Excellence in Machine Learning.